The 2009 NBA Draft produced two incredible offensive players. Eight seasons into their careers how do Stephen Curry and James Harden stack-up to the all-time great guards? 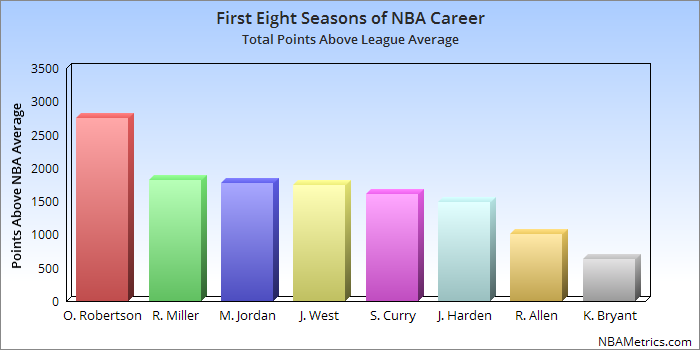 Curry and Harden are squarely in the discussion of great scorers. After eight years they sit a tick behind Reggie, Michael and The Logo. But since Points Above Average is era-adjusted Oscar Robertson crushes the field. Perhaps if league wide shooting efficiency declines Harden & Curry will look even better through the historical lens. But with such a big lead Oscar is probably safe atop the career scoring leaders for guards.